Also this year, Airtècnics will be present at the prestigious IFEMA International Climatización Fair – that will take place in Madrid, from 26 February to 1 March 2019 – showing at the ‘Climatización Show’ its exhibition space on technological innovations for heating, ventilation, air conditioning and refrigeration industry. Energy efficiency and sustainability are among the key topics of this edition, along with innovative heating, ventilation, air conditioning and refrigeration (HVAC-R) technologies. They will be the topics discussed in the relevant Forum. Furthermore, it will be given particular relief to the building management systems topic and the safety of refrigeration systems, with a series of technical and training conferences aimed at professionals in the sector. 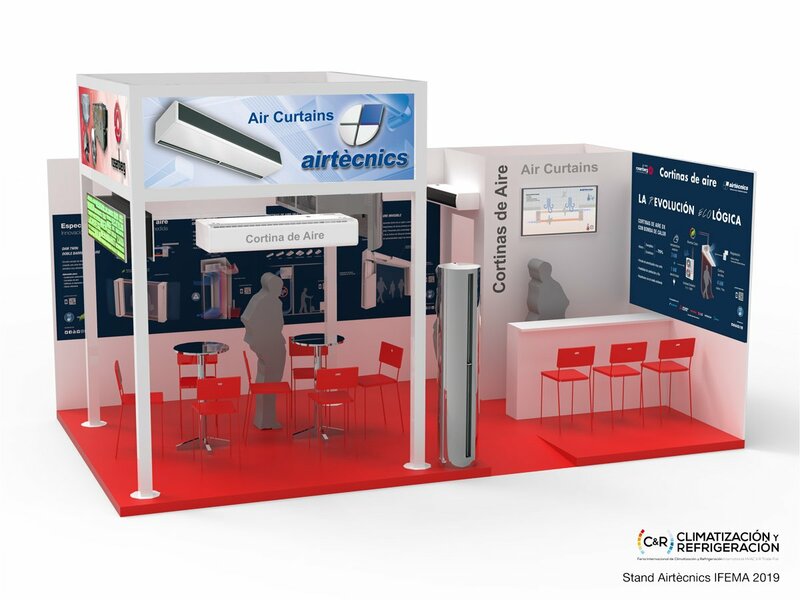 Placed at pavilion 10, Stand 10G28, Airtècnics will show its innovations regarding air curtains and HVAC technology. During the last years, Airtècnics has enhanced its innovations in air curtains with heat pump. Currently, it has developed a wide range of DX commercial air curtains that can work with the main brands of the heat pump manufacturing market – such as Mitsubishi, Hitachi, Toshiba, Daikin, LG and Midea – and can also boast considerable success in energy saving and the reduction of CO2 emissions up to 70%. It is a real big ecological revolution in the field of air curtains, obtained thanks to the experience and constant research of the high-level professionals team. Always mindful to the care of the environment and efficiency – without neglecting any detail even in design. The key that made such a result possible is the development of alternative technologies to the usual electric heating batteries. In fact, DX air curtains are designed and manufactured by Airtècnics incorporating a direct expansion coil. It results in a high energy saving and more sustainability. This fact is proven by the whole range of heat pump air curtains: Windbox M-G, Dam, Recessed Windbox, Smart, Recessed Dam and Variwind, together with Deco, Rund, Zen, Rotowind, Variwind VP and Invisair. The Airtècnics stand will also show the new insect control air curtains FLY equipped with intelligent control: another achievement for innovation and research. In this case, that is very important for the safety of food production facilities, catering service and health buildings. By correctly preventing the presence of insects in these structures the hygienic-sanitary requirement is safer. The models of anti-insect air curtains comply with the requirements of the American NSF / ANSI Standard 37 “Air curtains for Entrance ways in Food and Food Services Establishments” of the Federal Department of Agriculture and Pharmaceutical. The IFEMA is a reference point for the global commercial and industrial scene, involving leading industries and brands in over 500 annual events ranging from renewable energy to air conditioning, security and fashion products like clothes and jewellery. The property boasts an exhibition area of 200,000 square meters, 12 rooms, two convention centres, theme areas and a large pavilion with thousands of parking spaces. Set against the backdrop of one of the capital's most important shopping centres, the headquarters of the IFEMA International Climatización Fair is connected to the main city roads. The Adolfo Suárez Airport at Madrid-Barajas is very close, making the exhibition accessible from every corner of the world. Guests can also take advantage of public transport, thanks to the vast Madrid metro network that connects the venue to every point of the city.